Stay overnight on the gorgeous Greek island of Santorini where sweeping sand beaches, volcanic vistas and pretty whitewashed villages await! The trip is independent, meaning no excursions or activities are included  just ample free time to explore at your own pace. Round-trip transport by boat is included from Piraeus Port, as well as overnight 2-star superior, 3-star or 4-star hotel accommodation. Choose between a budget-friendly, 8-hour ferry crossing or upgrade to a 5.5-hour speedboat crossing to enjoy more time on sunny island. Start your trip to Santorini with a pickup from your central Athens hotel in the early morning, and travel to Piraeus Port where your boat awaits. Board your ferry for the leisurely 8-hour crossing to Santorini, or upgrade to include a crossing by speedboat and arrive on the island in time for lunch. 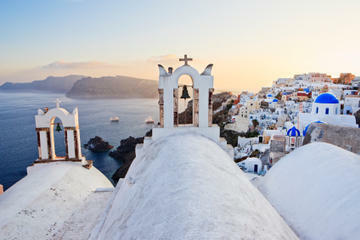 Once docked at Santorini Port, travel to your 3- or 4-star hotel in either Fira or Kamari. Check in to your hotel, and then spend the rest of your day at leisure. If you upgraded to the high-speed crossing, check out one of the islands waterfront tavernas for lunch, and then perhaps take a stroll around Oia, a picturesque village known for its white Cycladic buildings and blue-domed churches. In the evening, catch the famous Santorini sunset, watching the skies change color over the islands caldera (a half-submerged volcanic crater), and then check head to Fira. The islands colorful capital is home to a collection of lively bars and tavernas offering Greek island specialties and international cuisine. After breakfast, check out of your hotel, and then spend the morning and afternoon doing whatever you wish. Make the most of the Santorini sunshine by basking on one of the islands volcanic beaches such as Perissa or Perivolos. Alternatively, pay a visit to the old port of Ormos for lunch at one of the quaint tavernas lining the bottom of the calderas cliffs. Access to the old port is tricky with some 600 stone steps, so take the cogwheel cable car instead and marvel at the sea views on the way. The ferry crossing to Piraeus Port leaves mid-afternoon, so return to your hotel at the prearranged time for your transfer to Santorini Port. Embarkation for the speedboat crossing is in the early evening, leaving you with longer to enjoy the island before heading back to Athens. On arrival at Piraeus Port, finish your overnight experience with a drop-off at your central Athens hotel.